If you are looking for a guard dog,don't adopt a greyhound. They are very non-vocal and only run to the door to see if the person on the other side may have a biscuit for them. If not they go back to bed. Are you looking for a dog to jog with you? Remember greyhounds are trained to RUN. They will out run you before you even get done stretching. Get a Lab, they will trot along next to you and not make you look foolish. Do you like hiking in the woods? Greyhounds are sight hounds. When they see something they consider prey they will take off like a shot. They lock on that target and nothing will break their concentration. This is why these hunters have survived over the centuries. How about a dog to watch over your children? Greyhound are not very good at protecting the home. If you want a nice gentle, low maintenance, quiet and almost hypo-allergic pet adopt a greyhound. They won’t drive you crazy with incessant barking or leave fur all over you and your furniture. They will get you out walking which is good for both of you. Since they are not a dog with powerful strength they are very easy to walk, especially for older folks like me. I can easily walk four greyhounds at one time. The best of all reasons, they will find ways to thank you every day for saving their lives. Greyhound adoption and rescue continues to grow as more people become aware of these super dogs. Once you have decided to adopt a greyhound racer you need to do a little research. Check out local rescue groups and see if they are having any Meet and Greets in your area. Go and see these beautiful dogs up close and personal. 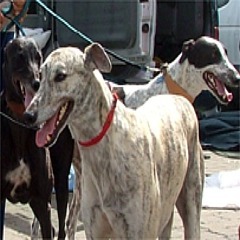 The volunteers with the rescue group will bring their own greyhounds to pet stores or town events and show them off. You will find that most people who share their homes with greyhounds are very proud of them and love to talk about having them in their homes. Ask questions, you will get first hand information on what they are like once they are off the race track. There may also be greyhounds that have been in other homes and usually for no reason of their own, have been returned to the rescue group. Sometimes their owners become disabled and can no longer care for their pets, sometimes it is just not the right home for the greyhound. Remember they are not a Lab who will play “fetch” with you for hours on end. To a greyhound if you throw a ball it is because you no longer want the ball—so why should they bring it back to you? Rescue groups will have you fill out an application for adoption to make sure you understand the unique personality of the greyhound as house pets. It usually will be followed up by a phone call and they will make sure that the Veterinary office you choose understands the unique physiology of greyhounds. There are groups who may also do a follow-up home visit once your greyhound has come home. If you have small children be sure they know that you can’t open a door and let the greyhound out. They can attain speeds of over 40 miles per hour and I don’t know of any human who could reach that speed without the aid of a jet engine strapped to their shoulders. Greyhounds are only as good with children as the child is with the greyhound. Children must be respectful of a greyhound’s bed, crate or favorite place to rest. Just as we embrace our own “space” greyhounds also like to have a little ME time. Keeping this in mind, find a group you feel comfortable with and begin the process. It is a decision you will never regret.